AMC Trails Blog: Pacific Crest Trail Volunteer Vacation 2013! Pacific Crest Trail Volunteer Vacation 2013! We have so many amazing volunteers who help us during the peak trail work season in the White Mountains from April to October, but somehow, that is still not a long enough season for volunteering on trails. No, we have seen a spike in interest in off-season volunteer vacations among our adult volunteers with the US Virgin Island Adult Crews on St. John – which we are running again this year in February! Therefore, we decided that we should continue this excellent trend by heading to the southwest in March to work on the Pacific Crest Trail. 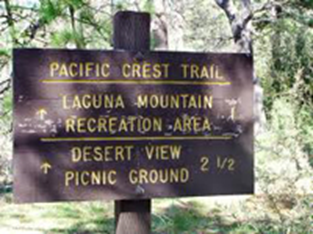 The PCT is a sister national scenic trail to our own Appalachian Trail. 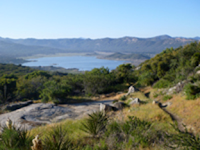 Congress designated both trails as national scenic trails in 1968, thus incorporating them into law and decreeing that they exist for the enjoyment of all people. We hope to ensure that enjoyment by helping the Pacific Crest Trail Association maintain a portion of the trail outside sunny San Diego. From March 22-29, we are going to work and stay in Lake Morena Park near the southern terminus of the PCT to help standardize the trail, improve the tread, install drainage structures, and do whatever we can to help the PCT be an awesome place to get outdoors. So join us for this new opportunity, and enjoy some warmer climes in the winter too! For more information on the AMC/PCT crew, check out our project description. And contact me, Brendan Taylor, North Country Trails Volunteer Supervisor, at btaylor@outdoors.org for questions or to register.